Will And Denzel In New ‘Uptown Saturday Night?’: Magazine claims pair are interested in updating the Cosby/Poitier hit. 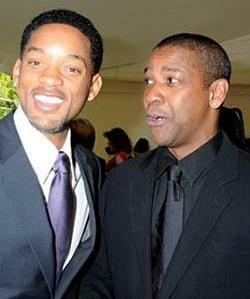 *Denzel Washington and Will Smith are reportedly in discussions to remake the 1974 film “Uptown Saturday Night,” which starred Sidney Poitier and Bill Cosby as two friends who sneak out of their homes to visit a legendary – yet illegal – nightclub. When the place is inevitably held up and their wallets are stolen, the duo must recover a winning lottery ticket that was sitting in Cosby’s wallet. Humor Mill Magazine is reporting that Will Smith bought the rights to the film in 2002 and has been trying to remake it ever since. Eddie Murphy was approached early on, but a deal with the superstar was never worked out. According to Humor Mill, Washington has now expressed interest in the “Uptown” remake and in starring alongside with Smith. Next ArticleLatifah, Whitney Among BET Honorees: Third annual 'BET Honors' set to tape Jan. 16 in Washington for Feb. broadcast.